France is currently in official mourning for three days, and Gorbio, like every other French town or village is displaying the tricolor. 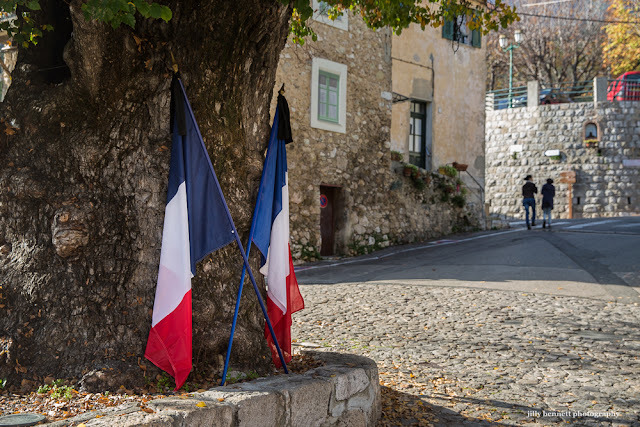 In Gorbio, the flags, topped in black and at half mast, are placed against the 300 year old elm tree, the beating heart of the village. La France est actuellement en deuil national pour trois jours et Gorbio, comme tous les autres villages et villes français, affiche le drapeau tricolore en berne. Ici, les drapeaux sont placés contre le vieil orme de 300 ans, le cœur battant du village. Horrible world we live in sometimes. It is a terrible world at times. The French flag is flying here at our City Hall at present. In Holland, flags were also at half mast yesterday + 1 minute of silence at noon. Also a lot of attention in the media.